Trump's Campaign Paid Millions To His Own Properties, FEC Documents Say : The Two-Way Now that he's declared his campaign for re-election, President Trump can continue to funnel money into his own businesses, but the payments will also face more scrutiny. 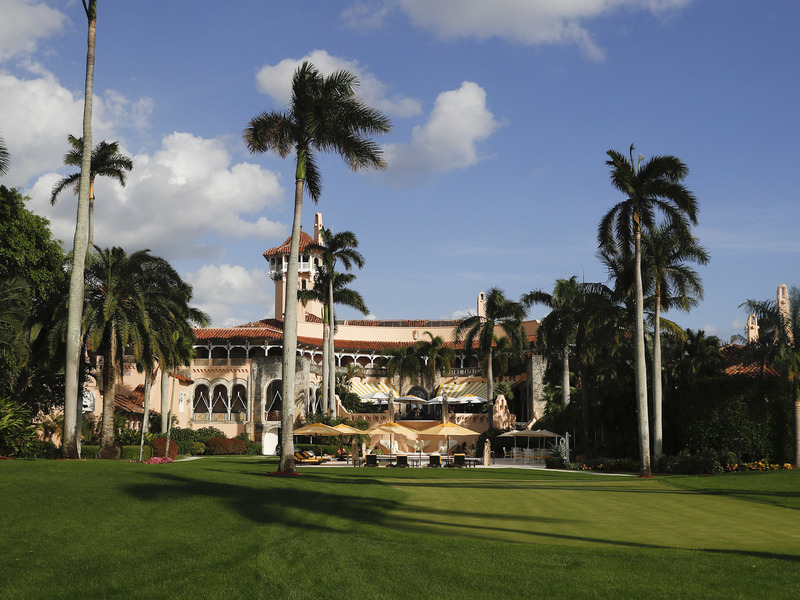 Donald Trump's presidential campaign spent $435,000 for facility rental, catering and lodging at his Mar-a-Lago resort in Palm Beach, Fla., according to Politico. Donald Trump's presidential campaign had many unusual aspects, not the least of which was the huge amount of money it funneled into Trump's own businesses. And now there's a new twist: Such payments can continue indefinitely because he's already declared himself a candidate for re-election in 2020. Documents filed with the Federal Election Commission show that Trump's 2016 campaign paid millions of dollars to fly on his aircraft, compensate his relatives for unspecified campaign activities and rent space in Trump properties, including Trump Tower in New York, the Trump golf club in Bedminster, N.J., and Trump's Mar-a-Lago resort in Florida. How much money did the campaign pay in total? Politico did the calculations and came up with a figure of $12.8 million as of Dec. 31, 2016. Such payments are not illegal. Federal law allows campaigns to compensate businesses owned by candidates for any goods and services provided. But the amount of money Trump's campaign funneled to his own businesses is on a scale rarely if ever seen before, says Norm Eisen, ethics adviser to former President Barack Obama. "It's customary for campaigns to provide some reimbursement, but we have never seen anything like this. It merits close scrutiny," Eisen told NPR. He said the watchdog group he chairs, Citizens for Responsibility and Ethics in Washington, is "poring over the records to make sure the charges are justified and legal." CREW recently sued Trump alleging that his overseas business interests violate the Constitution's Emoluments Clause, which bars presidents from accepting payments from foreign governments. Campaigns are supposed to pay "fair market value" for goods and services they use, but determining what that is can sometimes be difficult, says Larry Noble, general counsel of the nonprofit Campaign Legal Center. "Sometimes it causes problems. The question is, what is fair market value? We've never seen it on this kind of scale," he said. Noble notes that last month, Trump took the unusual step of announcing his candidacy for re-election in 2020. Most presidents wait to do so until after the midterm congressional elections, he said. Because Trump announced so early, he can continue to take in campaign contributions and use some of them to compensate his businesses, Noble said. On the other hand, by announcing early, Trump will also be subject to numerous restrictions on his activities, he said. "Now that he's declared he is a candidate, you get to look at his activities to see if in fact he's doing something as a candidate versus as a president, and if he's doing it as a candidate, it has to be paid for out of campaign funds that are subject to limits and prohibitions," Noble said. He notes that presidents often are called upon to speak on behalf of other candidates or attend other political party events. "When he goes out and gives those speeches, people are going to watch and see whether he talks about his campaign or his candidacy — and if he does, it's a campaign event, and not just a political event for anther candidate or an official government event," Noble said.